Appearance: Blue-skinned ghelnoids (humanoids with insectoid characteristics) with white hair and any shade of blue or green eyes. There are some variations in skin tone, some bordering on greenish, and likewise the form and placement of their antennae varies between the different subspecies. Forward facing emotive stalks are the most common, however, making up in excess of eighty percent of the population. Notable Customs: Andorians have proven themselves a naturally paranoid and violent species, and the practice of engaging in duels to the death legally (also under Federation law) is by far the most infamous of their customs, even though Andorians exist who believe the Ushaan is a dated ritual that no longer serves the purpose it once did. Another custom is their traditional marriage, which involves two men and two women, which formed as a safeguard against children losing their parents to the hostile conditions of their home world in more primitive times, rather than any biological/reproductive necessity as is often assumed. Classified as Ghelnoid, a classification invented by Vulcan anthropologists who didn't find either Humanoid or Insectoid to be appropriate, Andorians are quite different from your average humanoid. Although now it lies hidden entirely underneath their skin, Andorians possess a skeletal structure much resembling that of insects, consisting of internal bowls and plates that compartmentalize their internal organs and are composed of a chitine-like material much stronger than calcium based skeletons. A survival mechanism designed to survive great falls, as one might expect of a species that evolved from cave dwellers on a world caught in a perpetual ice age. When one of these plates does break, however, they shatter; sending thin slivers of razor-sharp chitine burrowing through soft tissue with every movement, and the Andorian in question will lose consciousness almost instantly, the result of extreme pain and the need to hold very still. Contrary to popular belief, the antennae on Andorians are not part of an echo-location mechanism. The fluid-filled antennae serve a dual function, first as a supplemental hearing system, enhancing their hearing (that of their ears being relatively poor by humanoid standards) significantly in whatever direction they are facing, and secondly that of 'inner ear' in humanoids, necessary to maintain their balance. When lost, the antennae eventually grow back, and an Andorian can, with some time to adapt, still function with one antenna. In regards to telepathy, only one particular subspecies of Andorians, few of which remain, possessed this trait. In the three hundred years since the Aenar (white-skinned Andorians without vision) intermarrying between Aenar has lead most of their descendants to take on the appearance of normal Andorians. Some were born with sight, and no telepathy, while others remains blind like their Aenar ancestor, and capable of reading minds. The general consensus in the medical community appears to be that the Andorians cannot have both sight and telepathy, as telepathic and visual centers in the Andorian brain are one and the same. This is also regarded as the most likely explanation as to why the Aenar and their descendants are so adept at causing controlled and shared hallucinations in others. 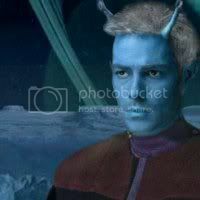 Andorian history is one of the great mysteries in the Federation, and something of a national past-time. Little is known of the time before the Kethni council was established, some eight centuries in Andoria's past, only that the Andorian Imperium was united once before and owed its name to a warlord named Krotus, who is often compared by historians to the Human Alexander the Great or the Klingon qey'lIS (Kahles), but unlike Alexander the Great succeeded and unlike qey'lIS was not attributed godlike qualities. Krotus's campaign to conquer Andoria took 39 years, over the course of which his small army of foot soldiers armed with swords and speaking an obscure language grew and evolved, to travel by rail and ice-breaker, armed with cannons and spear guns and speaking a whole new language, Graalen, which is still the leading language on Andoria today. In the wake of his conquest, the Andorian industrial revolution began. Ultimately, however, Krotus fell, murdered by his own daughter, and the Andorian Imperium fell apart again, his generals and governors fighting over the pieces, only now able to do so with weapons far more destructive than anything that had been available before. This went on for centuries until Lor'Vela, the daughter of one of these feuding warlords, Geshev, struck a deal with some of her mother's enemies and challenged her mother to a duel to the death. She survived the duel, got her mothers enemies what they wanted and succeeded in creating a little bit of piece in the middle of the war torn world. In the years following this she managed to persuade, one by one, the most powerful of the feuding warlords to reunite in what would become the Kethni council, and as an unfortunate part of the process the council agreed that, in order for their differences to be left behind them indefinitely, it would be necessary to destroy all clan records from before that date. Andoria became a star faring civilization some three and a half centuries prior to Federation founding (in the nineteenth century on the human calendar), after dispatching sleeper ships to Quardis II 8.1 light-years from Andoria and Chimera III, 11.5 light-years away. Many of the sleeper ships never arrived at their destinations, and those that did arrive met with mixed success. Cimera III proved to be a world where the temperatures were comfortably low for the Andorians, but with warm oceans and fertile land. Quardris II was a rock, barely class M, rich in minerals and metals but supporting little that was edible or could otherwise help the colonists survive. And they didn't. When over a century later the first warp-capable vessels of the Imperial Guard reached the planet, they found nothing but logs detailing the slow and painful deaths of their people, though in the following century the planet would be resettled nonetheless, with new technologies compensating for the lack of natural resources. First contact between the Andorians and another species occurred for the first time at Cimera III around the earth year 1930, where they first met with the Orion’s, claiming to be Rigelians. They exploited the colony for some thirty years, and then simply stopped appearing as the Andorians had begun to work toward their own warp capable vessels, the first of which was called the Lor'Vela. First contact between the Andorians and Vulcan’s occurred a few decades after. The Andorians had begun expanding their sphere of influence, colonizing a number of worlds in the immediate vicinity of their home world and had already begun to see to it that their military would be able to protect it, when they first encountered the real Rigelians. It was the Rigelians that called in the Vulcan’s to clear up the ensuing misunderstanding, that of Imperial Guard vessels not discriminating too much between real Rigelian transports and Orion’s pretending to be. The interplanetary relationships that followed from this were tenuous at best, and the Vulcan’s watched with concern as yet another warlike young race got uncomfortably close to their borders as Andorian colonists descended on the planet Weytahn. The Vulcan’s moved in, and they would fight and skirmish in space, on land and at the negotiating table over the planet for almost two hundred years, an ongoing conflict that lead the Andorians to regard all new species they met, like the Tellarites, with a high degree of suspicion. One can only keep this up for so long, and when at the end of these two centuries a new species presented itself, capable of talking to all three of the older star faring cultures, the Andorians surprised themselves by signing away much of their sovereignty and independence to the fledgling United Federation of Planets. Andoria since has seen varying degrees of resistance to the Federation, going even so far as terrorism aimed against it, and in an effort to appease the fluctuating, but ever present numbers of malcontents it has tried to hang on to as much of its national identity as possible. Today they still control all their colonies, and the Imperial Guard still patrols the space between them, accounting for the relatively low number of Andorians in Starfleet.